Date Of Publication: 05 March 2009. The game of triumphs is about a 15-year-old girl named Cat. As far as she is concerned her parents died in a horrific car crash. Subsequently she has lived with her auntie Bel since the age of three. As usual Cat is wondering aimlessly around London. Little did she know that all around her a game was being played. A game of chance, a game of consequences and a game of unsurpassed prizes. Cat stumbles into the bewildering world of the Arcanum where questions are answered and secrets are revealed. Just like so many players before her, Cat now has something to play for. Though the odds are heavily stacked against her, will this orphaned girl find her answers in the strange world of the Arcanum? Laura Powell has a good idea here. I think the intention is to appeal to the teenagers who are unsure about their place in the world. I know that when I was that age I wished there was a place to escape to. I think that this world called the Arcanum is a reflection of that desire. So just incase you are unsure as to the fundamental story line allow me to give you the basics. Essentially it is about a girl named Cat who is a bit of a loner and a wonderer. 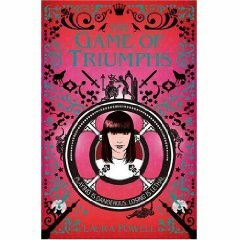 She stumbles across a game called The Game Of Triumphs. This is a place where people can win wonderful prizes. For example one of the prizes is the power to indulge in all the sins of Satan and not have to pay the mortal price. To enter into the game you need to transport into an alternate world called the Arcanum. In this world Cat uncovers a secret about her past and feels that she has no choice but to try to reveal the complete truth of her dark past. She travels through the Arcanum with three other companions. The build up is slow however; it seems to take an age to move the story forward. And unfortunately when the story is pushed onward it is not done effectively. At the beginning the explanations and understanding of the rules of this bizarre game were not made clear. However this was intentionally done by the author to keep a sense of mystical bewilderment. We can assume that the purpose of this was to keep the reader intrigued. Nevertheless this act of trying to maintain the reader on the edge of their seats was dealt with rather awkwardly. In fact as much as it is my displeasure to say this, I think that a lot of the narrative in the book was dealt with awkwardly. Two thirds of the way through the book it is still not clear exactly how the game works. The characters seem to have such an understanding of how the game works that they immediately figure out new things within it. Cat manages to pick up the rules and intricate workings of the game with immense speed. This would be fine if this understanding was communicated effectively to the audience. This however is not the case. I, as a reader, was left in the dark about a lot of things. As a result I felt as if I was missing something fantastical or crucial to the plot. The extent of this awkwardness throughout the book hinders the enjoyment of it. This is down to the use of language as well I feel. This is a book aimed at people of 12 - 15 years of age. I rang up my thirteen-year-old sister and asked her what imperceptibly meant. She couldnt even say it let alone understand it. On the same page the word irrevocably is used. The truth of the matter is that with both of these words I couldnt have given you a complete understanding and definition without looking them up in the dictionary. The issue with this is that a young person who does not understand these words is not going to have the patience to look them up. These books need to appeal and be accessible. This lack of appreciation for more simple use of the English language will not allow the target audience to adhere to the author. This is no reflection on the intelligence of our young generation because as stated earlier I wasnt completely sure what these words meant either. There are a lot of really nice moments though. The descriptive language used is sometimes very effective. This is an example of such a description. "It had drowned a man in eternal winter, yet the closer they looked, the more its depths shimmered with rainbows, and light." The characters are very nicely rounded as well. It is a shame that we do not get a closer look into their past. I would very much have liked to have known why Blaine lived with a Latin teacher. Why did he have those scars on his arm? What was wrong with Floras family situation exactly? There was scope for this I feel. The trips to the Arcanum are dealt with very well. The surroundings are mostly very comprehensible and enjoyable. I would have liked to have seen more of it. The ending is rather surprising. You do not actually find out if they are successful. You are never told exactly what happened in Cat's past. Once again I personally felt that it was a shame to leave the book unresolved. My intention with these criticisms is not an attempt to put you off the book. It is simply to address the issues. For I truly believe that with some revision and a few redrafts this could be an immensely successful book.